Mark is getting hard. The lessons the past few weeks are leading us to the cross and in all honesty, they are uncomfortable. I could try to make these feel less painful, but I would be failing in my job. My job is to preach truth and in an age old saying, “to comfort the afflicted and afflict the comfortable.” If you are comfortable in your faith this morning, I hope you are ready to not like my sermon. If you are struggling, if you are full of pain and doubt or you just think you probably are not the best Christian and want to do better this week, then this sermon may just be a balm and buoy. Either way. It isn’t me, or how I preach it, it is the word of Mark and how he points to Jesus in this story. It begins with the timeless and classic question: Teacher, what must I do to have eternal life? And the story ends with the man walking away in grief over the answer. We will never have an answer that we can achieve. The young man had great wealth and it was beyond his person to sell it all- he just didn’t have the capacity. Some don’t have the capacity to serve the poor. Some don’t have the capacity to honor the sabbath. It doesn’t matter whether we struggle on Sunday mornings or get judgmental over how a beggar will use the money we give them. We all face an obstacle of not being able to follow the rules enough to earn eternal life. Not one of us. We can’t do it. We can’t earn it, work for it, believe it, pray for it, or buy it. And lest you are the person in the pew saying to yourself that you are the exception, “I have faith, I claim Jesus, I keep the commandments AND I serve the poor.” I am going to call you out. If it were possible for you to keep the laws enough to gain eternal life, then we don’t need Jesus. If you are the one who is good to go because of the good life you have lived, then Jesus wasted his time and his followers are fools. You can’t do it and neither can I. It just isn’t possible- any more than it is possible to have a camel pass through the eye of a needle. It cannot be done. Maybe you are one who has heard we can but it is really hard. Maybe you heard the eye of the needle was a gate through which camels could barely pass unless they were unloaded and crawled through on their knees; that we too must unburden ourselves and drop to our knees in prayer. I hate to break it to you but that is false. It was made up in the middle ages as a way to make sense of this passage, to offer a way to earn your way to heaven. It was an effort to make it possible to buy your way into eternal life- yet another painful lie from the church to control. It was a story which became a tool of abuse against the poor, the hungry, and even the hurting. The problem is, it still depends on us to earn it. And we can’t. We can’t earn salvation. We can’t give enough away, we can’t pray enough hours or for the right things. We are stuck in sin. That is the law and no human is exempt or above it. As Martin Luther discovered in his monastic studies, we are saved Sola Gratia (grace alone); sola fide (faith alone); solo Christo (Christ alone) – In grace alone, by faith alone, in Christ alone. And Jesus would have answered as he does in other places: “I am the way, the truth, and the life.” Christ is the grace, the faith and the answer. God knew we couldn’t do enough. The children of Israel tried for 40 years in the desert and still kept messing up. The most ideal of our abrahamic mothers and fathers kept messing up. The most beloved kings set on the throne by God, messed up. No one could do it. They couldn’t keep the law and God had made it pretty simple. 10 Simple Rules and no one could keep them. This is the beauty of our God. A God who changes God’s own mind (because God can do that! ), sets a new standard, and gives us life when we least deserve it. Enter Jesus. The master(’s) plan. The plan who frees us from our own inability and relies solely on the absolute sovereign divinity of God alone. The one who shifts the question away from what we can do and instead answers who can save us. The only thing required of us is to receive. God is offering us gift of presence, gift of accompaniment, gift of salvation through Jesus Christ. God is gift, not a contract or equation. We can’t keep up our end of the bargain, but God can. We can’t reason or work our way out of sin, but God can. We can’t find our own way, but God did. We won’t succeed, but God will. With God, through Jesus, we have our way through the eye of the needle because with God all things are possible. Life may present us with difficult circumstances and it may feel like God is far away. Evil may seem to have a hold on our fate or daily lives as in Job, but God doesn’t let go. God doesn’t go away. God remains and is steadfast in faithfulness to us. God restores us and renews us, wallowing with us in our sorrow and pain and lifting us back up once more, promising us hope for eternity. We just have to stop fighting God in action. We need to receive what is offered. And for the days that recieving is hard, we can always pray, Holy Spirit, make me willing to be made willing. When we stop thinking it is something we do, believe, or offer, when we recognize our own pitiable circumstance of soul, when we lean into our inability to save ourselves and own the discomfort of acknowledging our circumstance, we become able to see the answer, the gift, the light. Christ is the freedom who lifts us up from the pit and mire, who loves us still, saves us still, redeems us still. If we let him. The young man was offered a chance to follow Christ, to see what it means to let Christ be in his daily life, teaching, leading, and saving him. Christ offered him the chance to see what radical love, generosity, and hospitality can do to change the world. He walked away because he couldn’t let the control go. Christ is before you now and offering. What will you say? I for one hope you will say, Sola Gratia, Sola Fide, Solo Christo. You don’t have to be the greatest. You just have to be you. There is a new movie on Netflix, “Nappily Ever After.” It is the story of a woman of color and her struggle with personal identity. Because her hair was typical of her ethnicity, it was full of curl and kink, on it’s own, wild and wonderful. But she grew up in a world where she needed to conform to beauty standards that don’t embrace ethnic hair and she needed to straighten out the glorious curls to straight soft ones. I don’t want to give too much away, but suffice it to say, there was a hair debacle, and she decided she couldn’t spend life trying to be so perfect to the world, that maybe the hair God gave her was what she needed to embrace and that is when the story really begins and she finds her joy. It got me thinking of today’s gospel message in Mark and how as children we already know who we are. We already know we have the world’s greatest Dad or the kindest mom. We already know we have the best baby brother (or maybe worst, I mean, kids also know when they are pushed out of the limelight). We already know we look fantastic in our lime green shoes and bright orange sweater. We know we love big gentle dinosaurs and loving our babies and not broccoli or baths. We know we are great on the monkey bars and a little afraid of baseballs, but thrilled to try to hit them with a bat. We know our bodies are amazing and that band-aids fix everything. We know we are good at learning and our brains are soaking up the world. When the world gets to us, we aren’t allowed to wear bright yellow galoshes and golfing hats to church anymore. We get told we can’t wear pig tails at 45 let alone in the pulpit, even though we love how it makes us remember life is too short not to have fun and remember our youth. We get told we can’t skip in the parking lot, to sit up straight, don’t pick, don’t fidget, and eat your Wheaties. We get kudos for conforming and time out for being our weird and wonderful self. And then comes Jesus. Who already knows that the world has lied to us and taught us to value greatness over authenticity. In our Gospel for today he has told the disciples (for the third time) he is going to die and they just don’t get it . They are part of a world that values greatness, not sacrifice; world that is taken by power, not gentleness. They cannot imagine what he is telling them because they traded imagination for conformity and trust for power. So Jesus pulls a child into the equation, gently putting the child in the midst of them, setting the trusting one on his knee as a sign of affection and value. And then tells them they have to be like this child to get in line for his kingdom. She goes on to share 4 ways children teach us to follow God: imagination, risking hard questions, trust, and what divine power looks like. I took her themes and ran with them- making them my own in many ways, so really encourage you to read her blog on this topic as well. Children are able to imagine God in such unlimited ways. They are able to see the world through eyes of imagination and they see God that way too. God is limitless. We cannot imagine God enough. And as adults, we have forgotten to imagine. It is the reason Peter Pan is such a hit. We forget to imagine. And God is so amazingly big and able to do so much that we lose out on understanding God when we forget to imagine. Let your preconceived notions of who God is and how God works in our world go. Because God is not limited our understanding. God is strange and wonderful and bigger than anything. Embrace your imagination again and let God be big enough to be the answer to all the questions, even if it doesn’t add up in your adult reasoning. They also risk the hard questions. They aren’t afraid to notice when someone looks different or ask why something is blue. They keep on asking until they have an answer that works for them. They ask if they can have something not with greed, but with hope. They ask strangers for help and to be new friends. They ask why loved ones die, why some kitties are boys or girls and why we can’t stay and play instead of going to work. They ask with their hearts open and their trust on display. Just as we should with God. And wow, do they trust. They trust that there is always enough. They trust that God is enough and that they are enough already in God’s eyes. They have a trust in God that is so much bigger than most adults because they have not held back part of their hearts from the world yet. Children ask for the whole world because they trust the whole world is still open to them. And so is God’s kingdom. God has given us the whole world and we need to love on the gift God has given us; take it everywhere we can, and show it to anyone who will look and see. Finally, children show us what divine power looks like. It doesn’t look like the strongest or best, the first or the smartest. It looks like someone who gives up all the power to be the lowest. Because God did that for us in coming to be like us. God, in all God’s limitless power, consented to be small and low, vulnerable, and of no notice. So if we want to see God, we need to look at our children who are subject to our adult rules and limitations. Children whose bodies are used or abandoned at borders and alleyways. Who are sold for trafficking, and dying because we want more gun freedom than safety locks that protect them. Children who have no access or legal rights or power and trust us adults implicitly for healthcare, education, and even the meal on their plate. Children rely on others fully to meet their needs in their vulnerability, and still keep their hearts open, their imaginations on fire and their trust in God boundless. They are not in charge. They are not in control. They cannot make one thing happen. But in them, in their small bodies and wide eyes that see the world as it REALLY is, we can see God. Jesus is reminding us that we will not come to the kingdom with power and swords, with conformity and reasoning, but by giving up our control and power and leaning fully into our imagination, trust, and knowing who and whose we are. You don’t have to be perfect. You can wear pigtails to preach and imagine you are even wiser and more lovely for it. You can wear your bright yellow galoshes to church with your golfing hat. And you can trust in God . With all your heart. You can let go of what the world taught you, and trust that God gave you just what you needed the moment you were created- a love and knowledge that you are precious, beautiful, beloved and desired by God just as you are. You don’t have to be perfect. You just have to be you and let God do the rest. Author mistressofdivinityPosted on September 28, 2018 Categories UncategorizedLeave a comment on You don’t have to be the greatest. You just have to be you. I don’t have a moving story this morning. The gospel today IS the story. It has all the elements of the best sermon illustrations- discomfort, joy, hope, emotion and ah-ha moments. I am excited by this passage. It can be hard to imagine Jesus as human at times. We often sanitize the human side of him, opting for the divine aspect of God rather than the one who wore skin and sweat, acne and morning breath. For some, it may even feel blasphemous for us to consider Christ as ever anything other than perfect and yet he was fully human which meant a fully imperfect body. It isn’t a sin to have acne. It isn’t a sin to have a pockmark left after acne resolves. And yet, we must admit, it is imperfection. It is a sign of tissue that shows when trauma has been done and scars up after the infection subsides. And humanity bears scars. We bear scars of racism, classism, and even gender exclusion when we diminish each other for the body we are born with, the circumstance we were raised in, or how we were socialized. Jesus had this body. He wore flesh just like we do and felt the limitations of flesh just like we do. As Lutherans we declare Jesus Christ fully human and fully God. But we cannot claim his full humanity in one breath and deny it in the next. He was a human child who surely was told “no” so that he could learn. He was a teenager who did things that make mother’s frown and give stink eye; all things that are a process of humanity. He was socialized to believe certain things just like we are. And it is okay if this thought process makes you uncomfortable. It is supposed to be uncomfortable to imagine God experiencing the ugliest parts of humanity up close and personal, not as an observer, but as a participant. Our God is amazing and flexible beyond our comprehension and trying to comprehend God as perfectly divine and also divinely human is a struggle for even seasoned theologians. It is important to grasp onto the concept though in order to see a beautiful message of hope and promise found in our scripture today. The deaf man and syrophoenician woman’s daughter also had these imperfect fleshy bodies and the ones around them craved wholeness for them. So they are begging Jesus for hope and healing. And Jesus is still human even as he is healing in a divine capacity. Jesus’ very humanity is showing in this text. Here we see Jesus be corrected, learn, change, and bless in response. Lessons we desperately need to not only hear but since humans learn in so many ways, we need to see Jesus being fully human and learning from others. And here, he learns from a woman. Not just any woman though. A woman who has absolutely no social, legal, or religious authority to even look at him, let alone speak to him. And yet she does. She takes a chance on hope and promise because she already understands there is something incredibly divine about this man. And what mother would not do anything to heal their child? What mother would not jump fences, dance on desks, and beg in the face of incredible odds to see their child healed? Not this one. She goes to Jesus even though he asks to be left alone. She goes to him even though she is a gentile. She goes to him and begs for her daughter to be delivered. And he denies her. Some scholars argue that he is telling her she just has to wait until all the Jews have been healed. Except that Jesus has healed other gentiles at this point. They also argue the diminutive is sweet and kind calling the dogs puppies in the original language. But the fact is, puppies or dogs, neither have value. At meals and with guests, they are chased off with rocks. They are not the sweet companion pets we imagine them as today. They are a necessary nuisance that is barely tolerated and he attempts to chase her off by throwing rocks in a racial slur. In his socialized human form, he dehumanizes her and all gentiles as well. He came for the children of Israel, not gentiles. Not for you or me. She does not have the necessary qualifications to get in, no passport, no id. She was a necessary nuisance to be barely tolerated and chased away with rocks made of words. Still other theologians argue he is testing her here. But to be honest, it is inconsistent for Jesus to respond to a pleading person by testing them further. So when Jesus tells her that he isn’t responsible for her family right now, that his focus of nourishment and healing needs to be for the Jews, he simply sees through the scales of humanly socialized eyes and to be honest, is fully within the scope and purpose of his incarnate expereience. He didn’t come to save us all. He came for the chosen ones, the children of Israel. So no, he does not see her value. He is prioritizing others over her and her daughter because that is his purpose up to this point. And this should scare us. It should make us uncomfortable because Jesus is living the darkest side of humanity in this moment. The parts we do not want to acknowledge any more than we want to acknowledge we built a nation on stolen land. It only leads to really hard work and fear of loss for us to consider Jesus really seeing us in our meanest state. But this woman has nothing to lose and everything to gain by trying. She holds hope and faith tightly in her grip and declares her and her daughter’s value in that moment. And she boldly corrects him. She reminds him that even if consuming only the crumbs, she has a place at the table, a role in the kingdom of God, that she too was created in the womb by the master, the number of hairs on her head were counted before her creation, that she is fearfully and wonderfully made. And this is the beautiful point. He listens and allows his socialized understanding of the world, his scales of human eyes to fall away and his purpose in it to be fundamentally changed in that moment As though healing a blind man, his scales fall from his eyes and he sees her through divine eyes, acknowledges her, and recognizes her value in the snap of a moment- something most humans spend a lifetime doing, dismantling our socialized vision. In that divine moment, he understands the scope of his purpose among us as so much bigger than we can begin to imagine. In the moment he acknowledges her claim to her place at the table, his whole purpose and mission has shifted and expanded to God like proportions and we were gathered in. In that moment, he sees not just her brokenness and pleading, but even his own human brokenness through incarnate eyes. And this moment is the moment of your freedom. This is the beginning of redemption for us. This is the moment of hope and promise for all humanity because God sees the need of all of creation to be redeemed, not just the chosen ones. We have a responsive God. One who hears us, who realizes our human limitations and then crafts every way possible for us to be in right relationship with God once more. We have a god who blesses us for claiming the place at the table that God promised to us. Not because we did anything to earn it but because God created us for that. A God who will not condemn us or leave us wanting when we cry out, but instead a God who loves us and when we are scattered in our own darkness, will gather us in and bless us for remembering and knowing we belong to God. This passage is a beautiful broken moment of Jesus. Just like watching him be pierced and crucified, it hurts us. It is a mirror of OUR ugliness, our sin, our darkness. In this moment, Jesus reflects back humanity’s response to a broken woman. And she then reflects back to him that she is created in God’s image and worthy of his consideration. This dance, an engagement and entwining of humanity and divine is exquisite and prickly. And it is good. It is valuable. It is a struggle to witness and consider. We will be blessed in the struggle for naming our place, for claiming our purpose and value laid on us not by our own selves, actions, or faith, but by our creator and in that very moment, our soon to be redeemer. We do not need to be afraid to acknowledge the ugliness of this moment. The human limitations of this Gospel lesson are not about Jesus limitations, but about our human condition and a God who responds. My God listens and learns. My God grows to meet my limitations, because I cannot grow enough to reach God’s standard. God came into our darkness, entered into our sinful space and walked our broken world to redeem us. When we own our sin, own our incapacity to reach to God and cry out to the one who made us and promised to love us, remembering that we were created for this, that Jesus would die on a cross for this, God will bless us. We just finished a week of Vacation Bible School. My very first as a pastor. It was wonderful and we all had a great time. And I am exhausted. I joked on social media that I would take Holy Week anytime over VBS. The level of intensity and energy needed is great in either one, but I think VBS wins because it is in summer, at the end of the day, and I am already worn out by the heat before we even began each evening. It was wonderful and it was exhausting. Some activities give us energy, some take it- and as wonderful and exciting as VBS was, as the days passed, even the children began to flag with energy. We were all tired. In fact, I would say, my favorite part of each day was the end, when the children would lay here on the floor, sprawled out like puppies and we would talk about the day. We would share our stories of what mattered, what we learned, and hear about how God made a good creation meant to work together for everyone. It was a moment of respite, of stillness and quiet and peace. And then we had to get up and get moving again, to head home and get baths and pjs and bed. But for a moment we stopped. And in that moment we focused again on the one thing that refreshes and nourishes us: Jesus. Life seems to go like that. Waves of energy and exhaustion. Moments of stopping and going. Sometimes the waves of life feel as though they are lifting us up and floating us along, in others it feels as though they are tormenting us and we cannot seem to catch our breath in between. Horatio Spafford knew this all too well. He was a successful businessman with a wife, Anna, and five children. Before long, the waves of life took their toll. Their young son died of pneumonia and in that same year, much of their business was lost in the great Chicago fire. A short time later Horatio decided to take the family to Europe- a chance to breathe and rest. He placed Anna and their daughters on the Ville du Harve and at last minute, he was delayed to tackle Chicago zoning issues during rebuilding. He planned to join them on a later ship. In case you haven’t noticed yet, it is my tendency to pick up on the small pieces, the in between spaces of the lessons each week. To notice the gum under the counter, if you will, as the unattended and often unnoticed areas of our readings. We can all see and hear the big things happening in the gospel this morning. Making 5 loaves and 2 fish enough for 5,000 men and calming waves in the sea. I wonder though if you noticed the waves and the moments of calm, the moments that Jesus fills the gaps and eases the difficult moments? The small spaces where only God can fit and fill a need? So did you notice that they only counted the men? No women or children? Yet they were present, too and they were hungry as well. They were used to not being noticed or of value. Except Jesus saw them and he valued them. He healed bleeding women and dying daughters as often as he healed men of social value. He taught the disciples to value the hearts and minds of little children because they are pure and worthy of notice. And when they were there on that hillside, hungry and lacking resources, Jesus was there. He fed them, not just with crumbs, but with plenty. He fed their stomachs and he fed their hearts and souls by seeing them as precious and worthy of being fed. Later, when everyone gets caught up in fear of Rome and desire to be free, Jesus is there. Or rather, he leaves so that he can give them what they need- which is not another king to rule over them with power, but a Messiah who will deliver them from the powers of this world and grant them true life. This scene will play out several times before he finally dies, and is a significant part of our Holy week narrative. And there too, Christ sees what we need most. Even though he is welcomed with waving palms and cloak strewn streets, he understands we need deliverance from our fears, not a ruler over our bodies. And he chooses death on the cross to give us what we need most. And again, in the boat, surrounded by swells and storms, in fear and crying out, Jesus is there. Once again, he fills a need. He speaks to the waves and calms them. He tells the disciples they are not alone, not to fear, and then delivers them to safety. Jesus is in the small spaces. He is in the moment that the people are tired of standing so he tells the disciples to have them sit. He is in the bread that suddenly becomes enough to feed around what scholars reckon to be about 18,000 people. He was with disciples who were trying to figure out how to feed all these people when Jesus commanded them to do so. He was with Anna as she sent that horrific telegram and struggled to breath each moment, having lost all 5 of her children, 4 at once and with Horatio as his ship skimmed the surface of his daughter’s watery grave. And he is here with us in the movement of the Holy Spirit still. Christ is in the moments of our lives that are exhausting and good, and also exhausting and hard. He is here in the fun and joy of VBS and he is here in the moments of grief and anguish. He speaks to the waves of life, Peace, be still, and when the waves will not be calmed, but our hearts need soothing, he is balm to our hearts, reminding us that he is with us, in the small places. I am grateful for a God who will go to the small spaces to fit in among the big things of life. Our God, who will make godself small and will suffer death and humiliation for me and my sin. Our God, Who sees your value and pays the priceless ransom for your soul. Our God, who comes to us in the small spaces in ways we cannot comprehend and fills us with just what we need when we need it. The Bible never said God will not give you more than you can handle. But it does say that WITH God, we candle accomplish and handle anything. God comes to us, always, coming to us, with love and compassion, with mercy and justice, with hope and salvation to deliver us and nourish us for the exhausting moments of life, both good and bad. God is here. Among us now. As you come to the table today, whether this is a moment of peace and restoration or a time of expended energy, ponder anew the wonder of our God who will make Godself as small as a baby to meet our needs. Who will bless the bread and make it enough for us. Who will gather us as one to nourish us as community together and who is the God of abundance in big and small ways in all things that truly matter: love, mercy and grace. It was a tragic story. In 2006 a university van carrying nine students collided with a semi truck. Give young people died that day. Among them a young woman with long blonde hair and blue eyes identified as Whitney. Four survived, among them a young woman with long blonde hair and blue eyes, identified as Laura. Whitney’s family went through all the proper responses. The burial of their beloved daughter was well attended with over 1400 mourners present. Their grief and distress was not eased by news of some surviving because for them, Whitney was gone. Laura’s family on the other hand held vigil at the hospital. They had been warned before seeing her of the injuries which included severe head trauma. Coma was to be expected along with difficulty communicating. They were shocked to realize Laura had gotten a belly button ring, but not angry. How can you be angry with your child when they have barely escaped death? Still, there were inconsistencies- but how do you question if your child is not your child? The nurses and doctors assured them it was the trauma making things confusing for Laura, until one day a nurse brought a whiteboard and asked the young woman in the bed to write down her name. Whitney. Not Laura. She had been in front of them and they had not known her- because she was not who they thought she was. But they let themselves believe the mistaken identity in order to cling to the life given to them. For one family the mistaken identity brought death. For the other it delivered life. The entire Gospel of Mark seems to be a question of identity for Jesus. Even he acknowledges that there is confusion. “who do you say that I am?” is tossed around like a beach ball at a pool party. And of course, Jesus doesn’t help this much by continually telling those who are with him not to go and tell what they saw. But this is Jesus hometown! Surely they knew him, yeah? How big could Nazareth have been? We know it was considered a backwoods size town, one of no repute. The likely population of about 400 meant that everyone knew everyone. He healed a few folks, but in the end, left for other villages where he was welcomed more warmly and along the way, he tells the disciples that they should do the same when they go out. If they are not welcomed, even in their hometowns, they should leave and not even the dust of the town should remain with them. The people of his hometown knew the snotty little kid, the pimply faced teenager-not this man who has quiet confidence and can heal people. But this guy? This guy has a full on entourage! How can this be the Jesus they knew? In their inability to see Jesus as anything more than just the same old guy he always was cost them. Isn’t that the way of things though? When we are more willing to talk than to listen, more willing to hold to our frame of thought and not hear another person out, when we are unable to consider a new way of thinking or doing things we lose out. If the people of Nazareth had questioned, that would be normal, but when given the opportunity to see and know Jesus as the Messiah, they ignored the proof before their eyes and it cost them everything. It does not cost anything but ego and time to listen to a different way of thinking, believing, or even doing things in the world. It may provide exciting new areas of growth, commonality, and even closer community. It could provide life to just listen and consider. There is a motif that runs through the Gospels called the Messianic Secret. It is a slightly outdated idea that is centered on the idea that Christ could not be known as the Messiah until after his resurrection proved it. It is fascinating to read up on, but when considered differently takes on a powerful impact for us. Initially introduced in the 1920’s, it argued that there were lots of false messiah’s and there was a xenophobic and nationalistic expectation of what a messiah would look and act like at this point. This explains the rapid turn of events during the passion week when one day Jesus is welcomed in with waving palms and cloaks thrown over the road to pad his way, and a short time later has crowds screaming for his death. They thought he was coming to literally take over Roman rulers. But that isn’t who Jesus is. The Messianic Secret also argued that it was a way to protect Jesus from his enemies. But none of this stands up very well in the bright theological lens of scrutiny. However, when we consider another way of thinking, it finds firm ground. What if Jesus didn’t want people to point at him and identify him and look at him, as much as people to accompany him, to live with and like him in a way that does not allow for pointing him out as different? My colleague D. Mark Davis wonders if it is not a redirection of the reign of God- rather than something we observe, it becomes something we participate in. And that is where his hometown just could not get in on the action. For whatever their reasons, they couldn’t participate with Jesus. For them, the idea of changing they way they lived and participated in the world was not an option. It was too scary and hard. So they denied him and his offer to live a new commandment of loving one another in radical hospitality. In a world of heated sharing, it can be hard to consider another’s point of view, let alone listen to it at all. It can be even harder when listening and considering may reveal truth and may mean that we can change who we identify ourselves as and how we do things. Maybe, we, like the people of Nazareth, and Laura and Whitney’s parents, need to consider that the person in front of us is not who we think they are either. What if we stopped seeing them as “ours” our enemy, our friend, etc. and instead as God’s; a precious child of God who is trying to participate in the reign of God and radical hospitality of Christ here and now in their own way. Jesus Christ is not just some guy. He was the Messiah, he is our risen savior, who calls us not to point and say, “Hey, that is my Jesus.” He offers to teach and show us, to let us listen and learn by walking with him, doing the work, preaching and living the gospel here and now in our daily lives. It begins with listening, but it continues with being. Confusing Jesus as some great person to read about and talk about but not to actively follow is a deadly case of mistaken identity not for Christ, but for us. If you are a Christian, then be one. Live into your true identity as a child of God and heir to the kingdom and reign that begins here and now. Go out and proclaim the gospel. 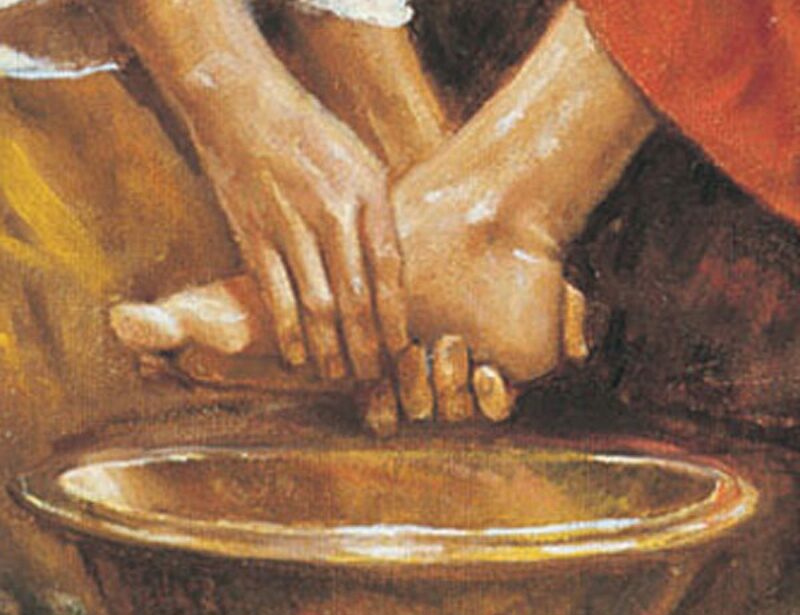 Heal the sick, comfort the poor and lonely, feed the hungry, and wherever you are welcomed, share the promise of eternal life in Christ with hospitality and love that knows no measure. Author mistressofdivinityPosted on July 8, 2018 Categories UncategorizedLeave a comment on Who is this Guy?